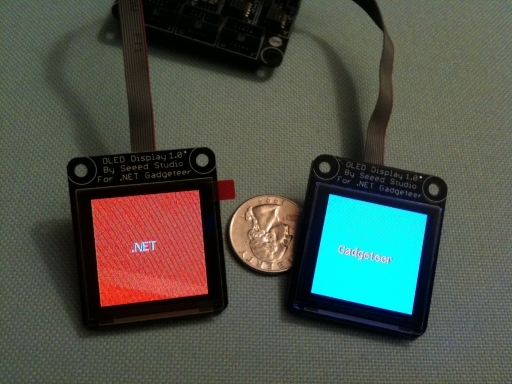 .Net Gadgeteer: Dual Seeed Studio OLED Displays?! Yes! You can hook up two OLED displays at the same time. Here is the view of the displays on my bench. 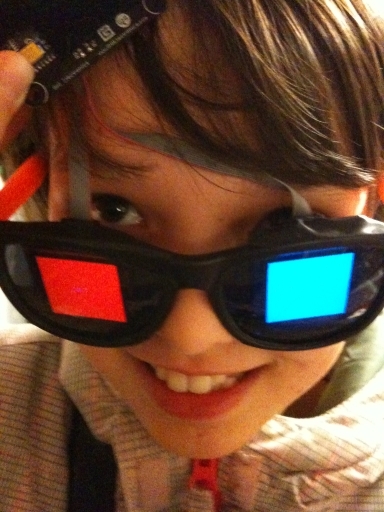 And here I have placed the displays into a pair of sunglasses. The code is trivial. Just drag into the Gadgeteer designer two displays and code as normal. Two bright OLED displays is a very cool option that opens up many possibilities. There are currently two display options available for .Net Gadgeteer…that I know of. You can always create your own too. But of the two for sale currently which is faster at displaying graphics? To find out I created a simple test. The code below starts a stopwatch timer, then draws a bunch of elipses, and then stops the stopwatch and checks the time difference. I am assuming that rendering elipses is the same as rendering other objects but I should test other things like text just to see. We will have to come back to this later. Here is code for testing the speed of the Seeed Studio OLED display. To test the GHI 3.5″ touch display just swap out the OLED display with the GHI display. I just used the visual designer to do this and the only code change was to rename oledDisplay with “display” (the default name for the GHI display in the designer). Here are the results and I was surprised by the results. The GHI display was twice as fast as the smaller Seeed Studio display. I’ll post exact numbers if someone requests it. But twice as fast is convincing. For anything requiring fast display updates, like testing new modules, I would recommend the 3.5″. Once you have things figured out move to the OLED if the form factor requires it. For instance, I was playing with the gyro module and the accelerometer module and the 3.5″ display was very handy in getting a sense of the modules behavior. That said, I really like the Seeed Studio display. It is perfect for small form factors (its tiny at 26.8mmx26.8mm) and the colors are very bright. Both displays have their purposes. Just be aware of the speed advantage the 3.5″ display offers.